This lawsuit inadvertently highlighted one of Mars’ musical strengths: his uncanny ability to replicate the essence of familiar bands and styles. Mars knows he excels at this; in fact, his approach comes from self-aware cleverness rather than malicious copying. (Exhibit A: “Uptown Funk” refers both to Minneapolis electro-funk and a Prince-associated neighborhood in the city.) Mars takes homage-pop to the next level on 24K Magic. The unapologetically retro record conjures a cavalcade of soul and R&B icons (e.g., Zapp, James Brown, Prince) and movements (e.g., ’80s and ’90s slow jams, AM Gold, New jack swing). For the most part, 24K Magic’s energy never flags. Uptempo moments—the crisp, red-hot soul-funk revue “Perm,” Bobby Brown hat tip “Finesse,” and the frizzy electro-funk of standout “Chunky,” which also boasts well-placed female backing harmonies—alternate with slower, deeper grooves, such as those on the romantic “Versace On The Floor.” Still, Mars mitigates the album’s rote nostalgia with sly humility and humor. The playful lyrics of ’90s soul/hip-hop nod “That’s What I Like” (“I’ll rent a beach house in Miami / Wake up with no jammies”) are written from the perspective of a guy who loves himself (and luxury items) as much as he adores his lady. On the heartbroken, smoldering “Calling All My Lovelies,” Mars laments that the one he wants won’t pick up her phone. With a knowing wink, it also features a recording of Halle Berry’s voicemail. For all of its easygoing vibes, 24K Magic never skimps on sincerity. The album-closing “Too Good To Say Goodbye” is an unabashedly epic ballad with pin-prick precise instrumentation and arrangements: subtle horn bleats and piano, stacked harmonies, and one of Mars’ most emotional vocal performances. Such craftsmanship isn’t surprising; Mars is a musical wunderkind who can do everything—songwriting, composition, producing, and performing—and do it well. 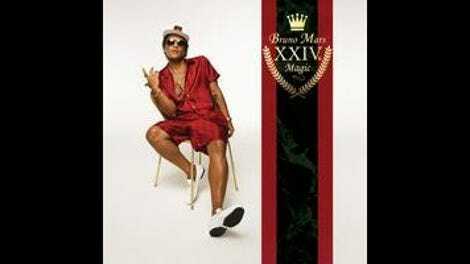 However, 24K Magic is easily his most cohesive and enjoyable collection, an escapist record that comes by its evocations of the past honestly. Purchasing 24K Magic on Amazon helps support The A.V. Club.